From the cofounders of the international sales training company, Dialexis, Inc. comes the groundbreaking method for the biggest challenges of every salesperson: getting through to almost anyone, and reaching top decision makers and high influencers. It's time to stop wasting valuable time using the by-the-numbers-plus-luck method--a grueling process that causes attrition and unethical dialing. SOAR Selling presents a solution to this critical problem by revealing by a proven way for any salesperson to make fewer calls, reach more decision makers, and, most important, get more appointments. The authors have tested the SOAR (Surge of Accelerating Revenue) Selling formula on thousands of live sales calls throughout key global markets. The results are staggering. According to the authors' client research, SOAR is astonishingly effective. SOAR provides a combination contact rate with decision makers and influencers of up to 90% on every net dial to a new prospect. Organizations have experienced 200% to 2000% ROI in just 12 weeks from program completion. 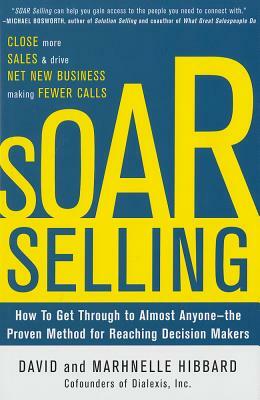 The mindset component utilized during SOAR enables the individual to be open to a new way of driving net new business. The coaching segment ensures the program consistently demonstrates revenue surge and ROI. MARHNELLE and DAVID HIBBARD are cofounders of Dialexis. Prior to this, David spent 18 years in the commercial real estate industry. Marhnelle began her professional career as one of the few women in commercial real estate brokerage and commercial real estate development. Their clients include Cisco, Los Angeles Angels of Anaheim, Xerox, IBM, AT&T, Berlin Packaging, Oracle Dell, Vistage, and many more.